Ann Mah is a journalist and the author of two novels, The Lost Vintage and Kitchen Chinese. Her articles have appeared in the New York Times, Condé Nast Traveler, Washingtonian, the South China Morning Post, BonAppétit.com, Vogue.com, and other media outlets. In 2005, she was awarded a James Beard Foundation culinary scholarship. Mah currently splits her time between Paris and Washington, D.C. If you'd like to receive a special recipe from Ann's travels in France, email her at ann@annmah.net. "A well-written entrée into French dining." "Consistently passionate and emotionally resonant, Mah’s prose brims with true love . . . A bighearted, multisensory tour of France." "The author’s investigations into the importance of each dish to the people she meets are beautifully woven together with her reflections on culture, identity, love, and marriage, resulting in an enjoyable and thoughtful read that sparkles with humor. . . . 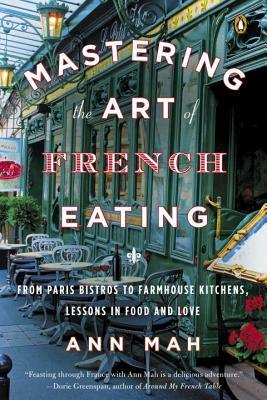 This honest, funny, and eloquent memoir is sure to delight lovers of France, food, or travel." "The real joy of this book . . . is in Mah’s mouthwatering, bite-by-bite descriptions of the plates set before her in Parisian cafés, country homes, and hole-in-the-wall foodie hideaways. Francophiles will delight in the smattering of French words and phrases sprinkled throughout every page, and serious cooks may endeavor to follow the lengthy recipes for a signature regional dish included at the end of each chapter." "Whether you’re French or Francophile, a long-time connoisseur of French food or someone who’s just figuring out the difference between frites and frangipane, feasting through France with Ann Mah is a delicious adventure. Ann’s writing is lovely, her curiosity boundless and her good taste assured. Spending time with her in Mastering the Art of French Eating is a treat." "Ann Mah dishes up a welcoming concoction, a good dose of French history, a personal, vibrant, enthusiastic picture of life in a country she adores, without apology. I am hungry already!" "Excellent ingredients, carefully prepared and very elegantly served. A really tasty book." “Ann Mah writes inspiringly about basic French dishes we thought we knew all about. She joins Elizabeth David in being a joy and an instruction to read." "A tour de force through French cuisine, Ann Mah crisscrossed France, learning about all my favorite foods—from buckwheat galettes to the secrets of authentic cassoulet. Her personal culinary tale will have you packing your bags. But if you can’t make it to France, Ann offers delicious recipes, culled from experts!" "Like a bowl of homemade cassoulet, this book is warm to the touch. Ann Mah writes about her international experiences—and origins—with great sensitivity. She gives us a peek into French kitchens foodies will envy, and no Francophile could resist."